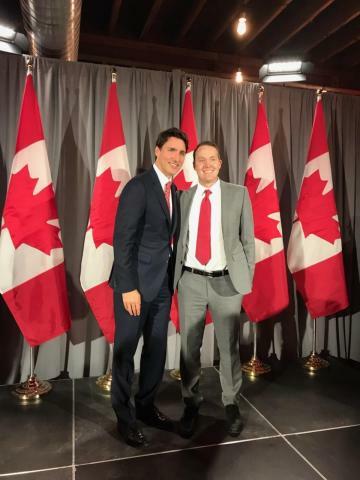 LEHI, Utah--(BUSINESS WIRE)--Ian Jenkins, CEO of Frelii Inc. (OTCQB: FRLI) (“Frelii” or “The Company") met in an informal meeting with Canadian Prime Minister, Justin Trudeau to discuss how Frelii’s artificial intelligence (AI) technology could be beneficial in advancing the safe and more effective use of medical cannabis products in Canada. The use of marijuana for medical purposes has been legal in Canada since 2001. In 2018, the country became the first major world economy to legalize recreational marijuana. Because of its national laws and relaxed regulations, the country is better suited at this time for use of this technology than other countries with more prohibitive laws. Jenkins added that the Prime Minister welcomed the opportunity for Frelii to look at Canada as a venue to expand into. This release contains certain “forward-looking statements” relating to the business of the Company. All statements, other than statements of historical fact included herein are "forward-looking statements" including statements regarding: the continued growth of the e-commerce segment and the ability of the Company to continue its expansion into that segment; the ability of the Company to attract customers and partners and generate revenues; the ability of the Company to successfully execute its business plan; the business strategy, plans, and objectives of the Company; and any other statements of non-historical information. These forward-looking statements are often identified by the use of forward-looking terminology such as “believes,” “expects” or similar expressions and involve known and unknown risks and uncertainties. Although the Company believes that the expectations reflected in these forward-looking statements are reasonable, they do involve assumptions, risks, and uncertainties, and these expectations may prove to be incorrect. Investors should not place undue reliance on these forward-looking statements, which speak only as of the date of this news release. The Company’s actual results could differ materially from those anticipated in these forward-looking statements as a result of a variety of factors, including those discussed in the Company’s periodic reports that are filed with the Securities and Exchange Commission and available on its website (http://www.sec.gov). All forward-looking statements attributable to the Company or persons acting on its behalf are expressly qualified in their entirety by these factors. Other than as required under the securities laws, the Company does not assume any duty to update these forward-looking statements. Ian Jenkins, CEO of Frelii Inc. met Canadian Prime Minister to discuss how Frelii’s AI technology could help Canada's medical cannabis industry.